Summertime is that time of year where families everywhere start planning their relaxation time, vacations, neighborhood block parties, BBQs, and globs of water activities. The air is thick with suntan lotion, bug repellent, humidity, summer blooms, and loud music. For families living with a child with autism spectrum disorder (ASD), however, the thought of summer can also create anxiety and dread. 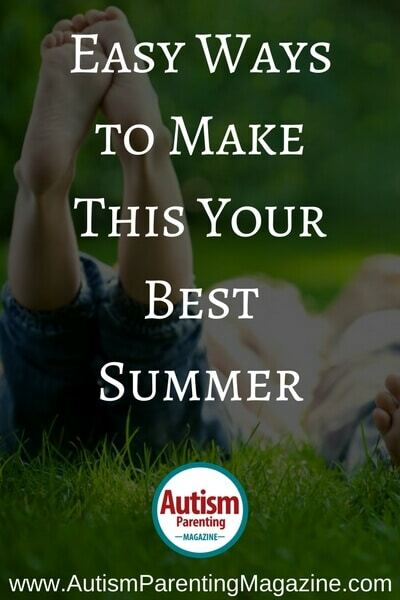 As autism parents know, summer may be synonymous with freedom from school (yay, no homework! ), but it also can lack daily routine. It may be a great time to cash in on some extra sleep, but it also creates a chance for increased boredom and the behaviors that go along with having less structure. Summertime may be perfect for hanging out with friends, but it can also trigger withdrawal for kids living with autism. Unfortunately, summer often creates a mixed bag of emotions for families who are all-too-familiar with how these changes in routine can trigger increased behaviors or regression in their children. Studies on autism have reported the importance of routine and structure for children living on the spectrum, but there is significantly less research regarding the struggles these families face during the dog days of summer. Create and keep a daily schedule:The daily schedule is often seen as the most important part of helping children with autism with task transitions, trying new activities, and (most importantly) creating and maintaining the structure they need. A summer schedule should include the following: a revised wake-up time, a breakfast schedule, and a hygiene schedule (showering, brushing teeth, dressing, etc.). These should be in sync with the slower pace of Schedules can vary from day to day to include chores, free reading time, computer/iPad time, fun outdoor activities, and community outings. Try a more relaxed weekend schedule in order to let your child sleep in or to take some extra time participating in a highly-preferred activity. Trya summer social group/summer camp specific to children with autism: Existing research supports the utility of placing children with autism in age—and developmentally-appropriate socialization groups or summer camps to build social skills, increase communication, and maintain structure. Socialization groups have the benefit of allowing your child to keep the structure he/she needs, with the flexibility of going home at the end of the day. Summer camp for special needs children has also been reported as beneficial for those with autism; however, kids are often away from home for several weeks. Parents should weigh the pros and cons of this option based on their child’s needs and Parents who opt for either of these choices should ensure that both social groups and/or summer camps include structured environments with skilled professionals who specialize in applied behavior analysis and in working with individuals with autism. Be flexible:Easier said than done, right? However, parents should allow free time on the schedule in order to include their child’s favorite activities. This option can be paired with a token economy. For example, if a child successfully goes from Monday to Friday with a structured schedule, he/she can earn a token each of those days and cash in the tokens for free time on Saturday. This can help increase compliance with a summer schedule while also allowing children to feel confident in their ability to earn a favorite activity. If caregivers choose this option, the preferred activity should only be allowed on the schedule during the free time, and only if the child has successfully earned it throughout the week. Annie Tanasugarn is a Board Certified Behavior Analyst, certified by the Behavior Analyst Certification Board. She holds an MS degree in Clinical Psychology and is completing the final steps of her doctorate degree. Annie has 15 years of clinical training in behavior management for both neurotypical and developmentally-delayed children, and she specializes in autism spectrum disorders. Annie has been trained in multiple intervention techniques that are integrated into her comprehensive 1:1, and parent-training programs. Annie’s online blog, The Autism Analyst, can be found at: blog.theautismanalyst.com, and she additionally holds a private practice in helping empower children and families impacted by autism and behavioral problems. Banda, D. R., & Grimmett, E. (2008). Enhancing social and transition behaviors of persons with autism through activity schedules: A review. Educational and Training in Developmental Disabilities, (43)3, 324-333. Bernard-Opitz, V., Sriram, M., & Sapuan, S. N. (2001). Enhancing social problem-solving in children with autism and normal children through computer-assisted instruction. Journal of Autism and Developmental Disorders, (31)4, 377-384. Walker, A. N., Barry, T. D., & Bader, S. H. (2010). Therapist and parent ratings of changes in adaptive social skills following a summer treatment camp for children with autism spectrum disorders: A preliminary study. Child Youth Care Forum, 39, 305-322. Annie Tanasugarn is a Board Certified Behavior Analyst, certified by the Behavior Analyst Certification Board. She holds an MS degree in Clinical Psychology and is completing the final steps of her doctorate degree. Annie has 15 years of clinical training in behavior management for both neurotypical and developmentally-delayed children, and she specializes in autism spectrum disorders. Annie has been trained in multiple intervention techniques that are integrated into her comprehensive 1:1, and parent-training programs. Annie's online blog, The Autism Analyst, can be found at: blog.theautismanalyst.com, and she additionally holds a private practice in helping empower children and families impacted by autism and behavioral problems.